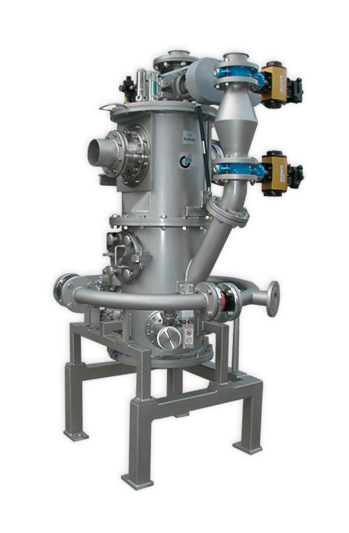 The fluidized bed jet mill consists of a grinding unit which uses high pressure gas, and a variable rotary classifier for selection of particle size in the milled product, all in a single compact and versatile machine. The high impact speed and accelerated air flow from the nozzles produces a high collision speed and very efficient grinding. 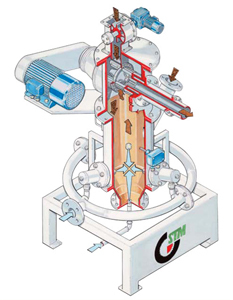 Compared with other types of air mills, this machine can save around 30-40% of energy. 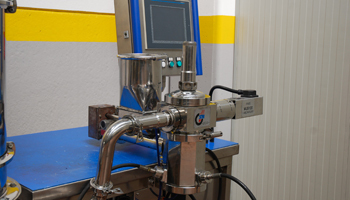 The main operational feature is the reciprocal impact between the particles: with automated grinding, the particles very rarely hit the walls and do not pass through the nozzles; the mill is therefore suitable for the pulverization of extremely hard, abrasive substances. The inside of the unit is fitted with a turbine classifier for ultra fine powders, a typical feature of the best mills, giving high-precision selection and a tight curve of particle size distribution. Automatic operation allows the grinding and selection machine to be used in full safety and without the need for constant supervision. 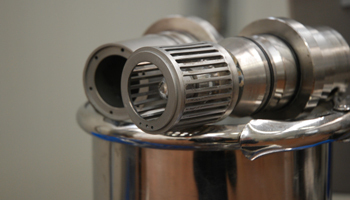 The material to be processed is introduced via a volumetric feed screw, and transported to the grinding chamber through a rotating star valve. Air or nitrogen gas at high pressure enters the chamber through nozzles situated opposite each other in the lower part of the machine. The accelerated particles of product collide at the point of intersection of the air jets, and granular reduction happens exclusively from this collision of particles in the fluidized bed. The ground product is transported to the ultra fine classifier turbine by an upwards air flow. The end product passes through the product outlet and into a reservoir, while material which has not yet reached the desired fineness is returned to the lower section of the machine. For extra fine particle sizes of products up to 10 Mohs hardness, obtaining fine and ultra fine powders (2 - 80 microns). 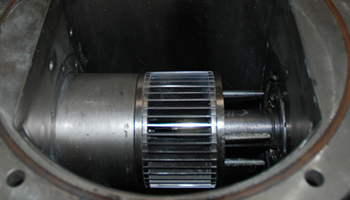 Jet mills suffer extremely low levels of wear and tear during operation. Therefore the resulting powdered products are absolutely free from contamination by iron. Jet mills allow unlimited use and complete absence of coarse particles. Ideal for extra fine, hard and abrasive substances.